This entry was posted in Food Glorious Food, Making, Creating + Frugal Living and tagged african food, budget meals, cous cous, frugal cooking, Frugal Living, morroccan pumpkin, recipes by cityhippyfarmgirl. Bookmark the permalink. I love your masterful language in writing about the method. Great idea for a quick mea, thanks! 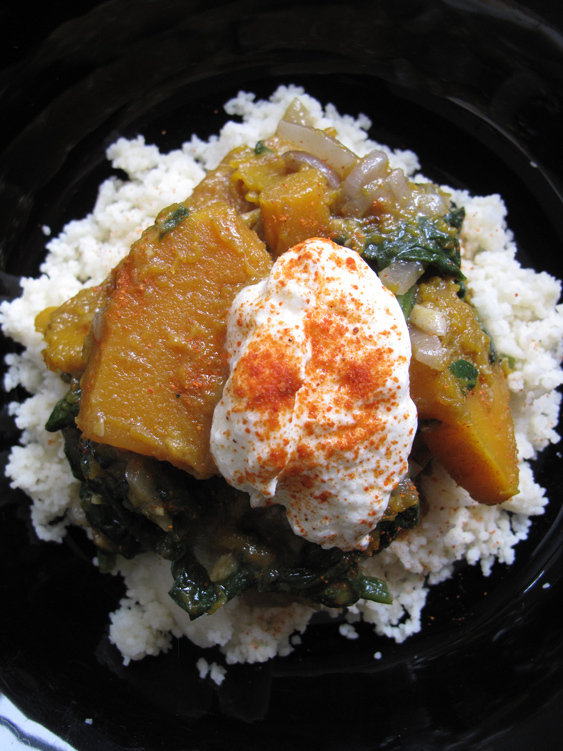 I often roast pumpkin with Ras el Hanout and add it to couscous for an instant Moroccan hit! Love it. Simple, healthy and it has funk! Heidi- thats how I cook. A whole lot of slurping, slapping, dashing and dolloping. I’m not a sifter! Love it! Looks delcious and nothing like a vroooom of attitude! Woweee., frugal Friday is one tasty dish at your place…, beautiful tastes you’ve got going on there Brydie. Oh my that looks so beautiful and yummy. Loving the recipes. If that’s a frugal Friday, can I come and live with you please? This is so making my mouth water. Anytime you want to come for a visit Choc! Urban wwoofing?